Windows Vista is now finally released, and Microsoft are banging on their marketing drum, blowing their PR horn. I had the chance to try out a release candidate of it and have also seen some of the final version. I have to be honest and say that I haven’t tested it too much, so my view probably isn’t as balanced as it should be (therefore I won’t cover deeper functionality). But from what I’ve seen, frankly, I’m not impressed. A lot of features are similar to those that can be found in Mac OS X, but with changed names, as this video points out. In all fairness, it’s impossible to tell what feature was ripped off (sorry, “inspired”) by the other company, but suffice to say, Apple got them released first. 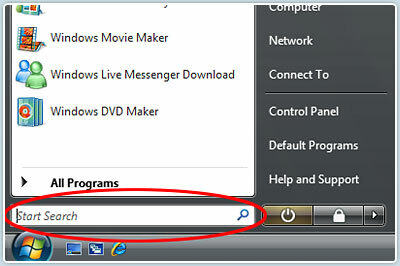 When I look at stuff like Instant Search in Vista, I can’t help but think of Spotlight in Mac OS X that has been around forever. Same goes for a lot of other features: what took them so long? Sure, they have a much wider user-base, hardware setups to cater to etc. but still! There are a number of years since we saw them in OS X, so why should we wait for Microsoft to release it way later? Another thing that I find entertaining is the horde of Microsoft fans who start to drool about things like transparency, 3-dimensional window flip etc. I’m convinced that a majority of Windows users haven’t ever seen Mac OS X; otherwise, they wouldn’t be so vocal about it, but instead just be somewhat content and try to comfort themselves that Windows is at least getting better. 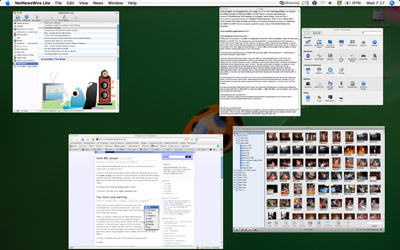 For instance, when it comes to productivity, compare Windows Flip 3D to ExposÃƒÂ© in Mac OS X, and then you tell me which gives you the best overview; I know which solution I’d put my money on. Sure, Vista’s solution is eye-pleasing at a first glance, but after the initial take, what’s actually useful? The "wow" started five years ago. I got the Beta last year and thought that the interface design was Apple all over, but not done quite so well. As for using it, there are certainly improvements but it was intensely irritating that pretty much when I wanted to anything I was greeted with a pop up asking me for permission. I don't use a different OS because I dislike Microsoft, I just think there are better, more intuitive and easy to use options available. Vista hasn't changed my opinion. Can I turn of all those flashy things if I install it? I just want a OS that works, and not "a flip, turn and morph everything you can imagine OS". Martin Odhelius: Exactly, or when they see the powers of XGL. Regarding the Spotlight and ExposÃƒÂ© features, many recently released Linux distributions have similar features- but since Linux is Open Source I believe it is all right for them to get inspired by other systems features, because they aren't making any money from it. The "Wow" factor certainly was five years ago. The saddest thing about their Sidebar is the blaspheming similarity with OSX's widgets. Copying the Dashboard is one thing, but come on, think of some new "gadgets". The same goes for the Chess game. It's not even a useful thing to have in an OS, but Microsoft copied it all the same. For the average user, there's very little in Vista to make it a compelling upgrade. Hence the relative lack of excitement surrounding its launch. I also think XP2007 would be a more honest name, since it's hardly the groundbreaking change in architecture OSX represented over OS9, or what was promised when Vista (then Longhorn) was announced. Innovation should only put you ahead for a short period of time. After an innovation is released, it becomes a good idea or a bad idea; good ideas should be emulated, while bad ideas should be avoided. It's best for the consumer if good ideas become ubiquitous. Then, new innovations can occur, and start the process all over again. It's how progress happens. It's not like these features require super-geniuses to think of them. Searching an optimized database of files/content/metadata, for example, is pretty much the most obvious thing to do to improve searching. It wasn't feasible before processors increased in speed, and now that they have the ability, the right to use it shouldn't go to the company that released the first OS since it became possible. I think that Microsoft should admit that Apple did it first, and be unabashed. I suspect that there my even be a few brilliant innovations in Windows that OS X would love to borrow in the next iteration. Progress runs on. Absolutely not. Good features shold be implemented. What I question is the time it has taken for them to do it, and the quality of the implementation, in some cases. I really don't understand Microsoft at all. They copy ideas then try and pawn it off like they invented it. 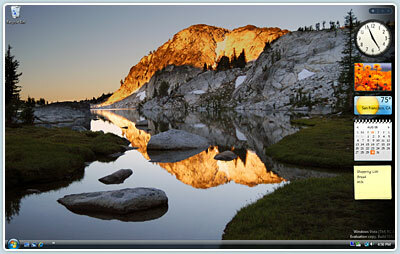 Vista to me looks 'Tacky' and I switched to Mac a few years back because Windows lack of imigination and usefulness. Vista just confirms my thoughts and I dont regret switching one bit. Mac offers a seemless easy to use interface. All vista has done is pile alot of gadgets and gizmo's into a Tacky interface which has resulted in a operating system were you are bombarded with alot of useless crap to be honest. I cant wait for Mac Leopard. As a Windows user between 1992-2004, i've seen and used some five or six different Windows versions. For the last two years I have owned a mac and used OS X. And i must say that OS X is lightyears ahead of Windows. While Windows feels like a graphical and technical patchwork of quick-fix solutions, it feels like the people at Apple has actually sat down and tried to make an OS that's good from the start. And one that is practical, and easy to use. Take that window-flipping expose ripoff for example; as Robert points out, it doesn't seem that useful. The reason that I use Expose in OS X is because it speeds up my work (it's a lot faster than alt+tab), not because it looks pretty. One of Microsoft's company policies is "Eat your own dogfood", i.e. if you develop a product, use it yourself to get your own user experience. Seems the problem with MS is that they only been eating dogfood for the last twenty years. 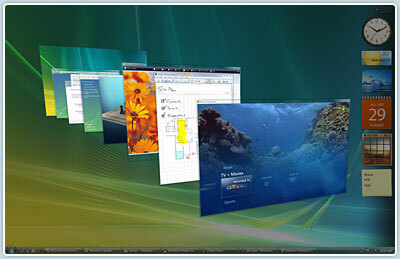 IMO XP was a real improvement when it came out (and at the time better than Linux?) and actually makes using a PC pleasant rather than infuriating (i.e. it crashes much less often than it used to). Having said that I doubt Vista can improve that much over XP as it seems to me that XP was the real jump forward. All the whizz bangs are nice but underneath it's still windows. I certainly won't be paying for an upgrade when I can get Linux for free. Ironically, the only thing at the moment stopping me from installing Linux on a dual boot is the worry that I will wreck my XP install! I guess I should just back it all up and lace up my boots, as they say. Why not just be satisfied with your Apple and shut up about Microsoft?? Absolutely. But do you think that is due to having the better product or just business decision in the past? Widgets were NOT – I repeat, NOT – Apple's idea. They have been around for years, first as Konfabulator, now as Yahoo Widgets. That Apple integrated them into the OS first, does not make it their idea. Just like a GUI wasn' t Apple's idea, but Xerox's. That Apple and Windows take inspiration from each other (yes, Apple looks at Windows too, example: http://brandonlive.com/2007/02/11/cupertino-start… is not a bad thing, but a great thing for the users! And for the competition, because that means that the OS that does the best job with the task at hand wins. Simple as that. I use Windows and don't mind Macs one little bit. It's only those newly converted users who wish to convert me too, that bothers me 😉 Why not just be happy with your OS, instead of bashing others? It's not like Windows is being evil to you, when you use OSX, is it? Generally, I agree with you. The most important thing is that everyone's happy. The problem to some, though, I think is that a lot of people can be very loud about their OS without ever having seen any other options. So, for me personally, I met Microsoft fanatics almost every day, who haven't seen anything else, but are convinced that Microsoft is best at everything. But please, take this post as my personal review of it, and of course it's ok for other people if they don't share my opinions.